Trouble falling asleep? Here are some lifestyle hints to help you get the shut-eye you need. 1. Maintain a regular sleep and wake schedule. Getting to sleep at the same time every night and waking up at the same time every day helps provide the body and mind with a balanced routine. Once a routine is established, you will notice that you start to feel drowsy towards the end of the night and can fall asleep easier without tossing and turning. You may also discover that your body arises on its own around the same time in the mornings without the use of an alarm clock. 2. Establish a relaxing bedtime routine. Find something that works for you. Some options could be to read a book, listen to soothing music, or take a bath. 3. Design your sleep environment to be cool, dark, quiet and comfortable. A bedroom that is too hot or too cold can affect the quality of sleep. For most people, the optimal temperature to sleep is between 65°F and 72°F. Also, our natural melatonin production increases when in a dark environment. Melatonin is the body’s hormone that makes you drowsy and helps you drift off into sleep naturally. 4. Turn off Wireless Router and remove cell phones from your sleep environment. Cell phones and Wi-Fi are constantly sending electromagnetic signals and some people may be sensitive to it. While research is ongoing, some studies suggest that sleeping near a phone or around Wi-Fi can interfere with the brainwave patterns and sleep. 5. Sleep on a comfortable mattress and pillow. You should have enough room to stretch out and move around comfortably. Uncomfortable mattresses may lead to back or neck aches, which can disrupt your sleep in the middle of the night. You want to make sure that your pillow does not prop your head up too high or tilt it back too far. Also, if you tend to sleep on your side, it may be necessary to sleep with a pillow between your legs to help your hips stay aligned. 6. Finish eating 2-3 hours before bedtime. Sitting upright or moving around helps our body digest meals. While you are lying down, the body works harder trying to digest the stomach’s contents which may cause restlessness. Regular exercise can uplift the mood and reduce anxiety. Over time, this promotes a calmer, more restorative night’s sleep. Exercise raises your core body temperature and your heartrate. It is best to finish a workout at least 3 hours before bed so your body can cool down and start to relax. 8. Avoid caffeine close to bedtime. Caffeine is a stimulant which makes the mind more alert and signals the body to get up and going. Caffeine blocks sleep-inducing chemicals in the brain and promotes adrenaline and cortisol production. A typical 8 oz. cup of coffee contains 95 mg of caffeine. Depending on how much is ingested, caffeine can stay in the system for 8-14 hours. 9. Keep a sleep diary. Monitor foods you ate that day, any exercise you performed, any stressful events and finally how many hours you slept. This may help identify what may be affecting your sleep. 10. Add a natural supplement. In times when sleep deprivation is taking a toll on your health, some supplements may offer the help needed to get a restful night’s sleep and get your body back on track for a normal sleep schedule. Melatonin is a naturally-occurring hormone in humans that is produced by the pineal gland and plays a role in the regulation of the sleep-wake cycle. It is secreted by the pineal gland after your body senses the fall of darkness at the end of each day, and keeps your body synchronized with the rhythms of day and night. It is also a powerful antioxidant that supports immune system function. As we age, melatonin levels decline, so supplementation is necessary to provide optimal levels of this important hormone. Scientists believe this reduction is the reason why older adults have more trouble sleeping than younger people. 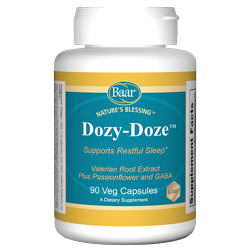 Dozy-Doze is a combination of ingredients formulated to help you ease your mind and relax your body so you can drift-off naturally into a restful sleep. Dozy-Doze combines extracts of Valerian and Hops that have been traditionally used to promote a calm relaxed state and support rejuvenating sleep. GABA is a neurotransmitter normally produced in the brain and is known to ease nervous tension. Dozy-Doze combines select herbs to relax the nervous system to help you enjoy a tranquil night and wake up refreshed and energized in the morning. Dopamine is a neurotransmitter that promotes enjoyment and interest in life. Containing 15% L-DOPA (the immediate precursor of dopamine), Velvet Calm™ provides the body with what it needs to make this important neurotransmitter. Mucuna pruriens, commonly known as Velvet Bean, has been used in traditional Ayurvedic medicine in India as a nerve tonic and adaptogen. Balanced Dopamine levels can help the body control muscle movement and increase pleasure, desire and interest in life. Since Velvet Calm™ affects the nervous system it may help promote better energy, improved sleep patterns, relieve anxiety, reduce cravings, calm the nerves and boost the overall mood. This entry was posted in Sleep on September 17, 2015 by Dr. Bruce Baar.